The I-7000 Data Converters contain a "Self Tuner" ASIC on each modules. This chip can auto tune the data baud rate and data format in the whole RS-485 network. Put simply, the user may use to link a PLC, RS-485 device, RS-232 device and other PC over a RS-485 network even if the data format and data baud rates of these devices are different. Connect your serial device easily to your company network using this device and its accompanying COMM port emulation software. Connect your serial device easily to your company network using this device and its accompanying COMM port emulation software. I-7188E3 gives 1x RS232, 1x RS485 and 1 port that can be used as either RS422 or RS485. When you buy an I-7188EX-MTCP controller, it already includes the default Modbus firmware installed into its Flash memory. This RS-485 high speed Isolated repeater can be used to boost the signal and provide isolation between different sections of a network. This RS-485/RS422 high speed Isolated repeater can be used to boost the signal and provide isolation between different sections of a network. It is also able to convert between 4-wire RS422 and 2-wire RS485. RS-485 Isolated 3-way Hub : From a single RS485 Input, this unit provides 3 independent RS485 output channels. 4-channel RS-485 Active Star Hub, providing 4 independant RS485 Output channels and a single input channel. Other features include RS485 short circuit protection, internal jumper selectable termination resistors, LED indicators for power and network traffic. The I-7520 is a high-performance low-cost RS-232 to RS-485 converter packaged for convenience in a compact DIN rail mounted unit. 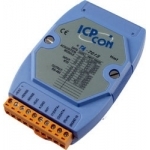 The I-7520A is a high-performance low-cost RS-232 to RS-422 or RS-485 converter packaged for convenience in a compact DIN rail mounted unit. The I-7520R is a high-performance low-cost RS-232 to RS-485 converter packaged for convenience in a compact DIN rail mounted unit. The I-7561 is a cost-effective module to transfer serial data over USB allowing you to connect your serial devices using a USB interface. The I-7561U is a cost-effective module to transfer serial data over USB allowing you to connect your serial devices using a USB interface. Includes support for Windows 8 and 10. The I-7563 is a cost-effective module for transferring serial data over USB. It allows you to connect serial devices to systems using a USB interface. The I-2541 is an RS-232/422/485 to fibre optic converter that secures data transmission by using fibre optic transmission to provide immunity from EMI/RFI interference. The CUR100N is a user friendly converter from USB to RS-232.